I came across a picture today. It was a drawing made by a someone I don’t know. I saw it online, I think it was in my Facebook inbox. 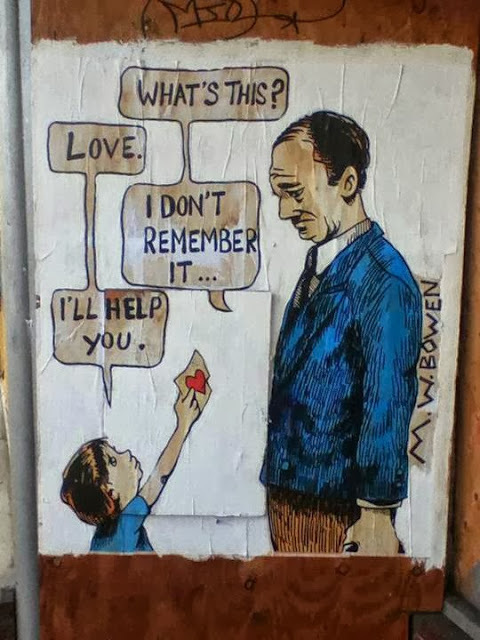 The artist’s name is written in the side. It is basic but genuine and to me conveys the most achingly beautiful sentiment. I will sometimes get an idea for a post, but I won’t know actually how it will turn out. It starts with a message I want to convey, whether it be simple or complex. Sometimes it can take days, weeks, months even. it just rolls around in that crazy head of mine waiting for something… a spark? Something to give it life. Incidences will happen; little things, really of no significance but then one day–wham! It all fits together. This picture was a catalyst. We share a collective consciousness. The good, the bad, the everything contained therein. The best and worst of us is inside us all. We share so much. One important need is to give and receive love. We are an empathetic species that thrives on mutual understanding and cooperation. We need togetherness. Newborn babies can die if denied love, it is ingrained in us, the need to reach out and be held. It is a basic and human need we first receive usually from our mothers and fathers. And it this need to touch to be touched lasts through our lifetimes. It is beyond sexual desire which in itself is powerful. It is grounding, it is humbling and uplifting. The nurturing touch of a hug builds trust and a sense of safety. 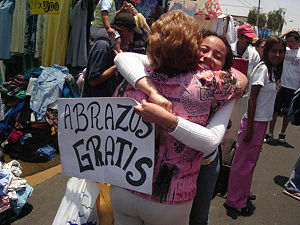 Hugging relaxes muscles; releasing tension in the body. They can take away pain and soothe aches by increasing circulation into the soft tissues. 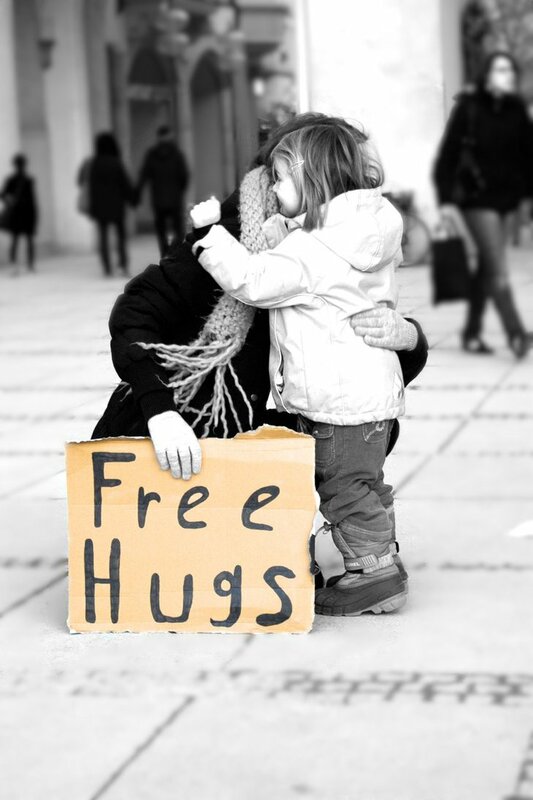 Hugs balance out the nervous system and boost oxytocin levels, which heal feelings of loneliness, isolation, and anger. Hugs are wonderful. They are warm and innocent expressions of affection. To me hugs are magical events. They are hopeful. They are happy. They spread happiness. We have a human need to be wanted and valued and accepted. A hug is a demonstration of that. There is much to be said about the power of a hug. I have noticed a trend as of these last few years of people with signs giving out free ones. It is a novel thing. it creates a bit of a spectacle and maybe it isn’t all that serious but it does make people happy. and it sends out a terrific message. I have noticed with the passage of time that hugs are becoming more freely given and socially acceptable. When I was a child one rarely would see two men hug, these days it is commonplace. This is a wonderful thing. It is such a wonderful thing and so is a kind word, a pat on the back and a smile. Sometimes we don’t know the burden another may be carrying and cannot fathom how one simple act of encouragement from someone; a stranger even and what sort of positive impact that it can have. If we all made a point of doing this; reaching out to others even sometimes going the extra mile to tell another person you care; whether it’s just an ear to listen. Sometimes all people need is a release; someone to talk to and a little sympathy. Sometimes it is a stranger, a person you will never encounter again, this does not lessen the quality of the interaction. Every positive interaction we have with another person makes them feel good and makes us feel good. it’s all good! And just like rabbits these positive interactions spread and before you know it the room is of full of rabbits. Try it you’ll like it. Hug someone today. I came across this in Tokyo. It was at night in a busy district. There were lots and lots of people there. 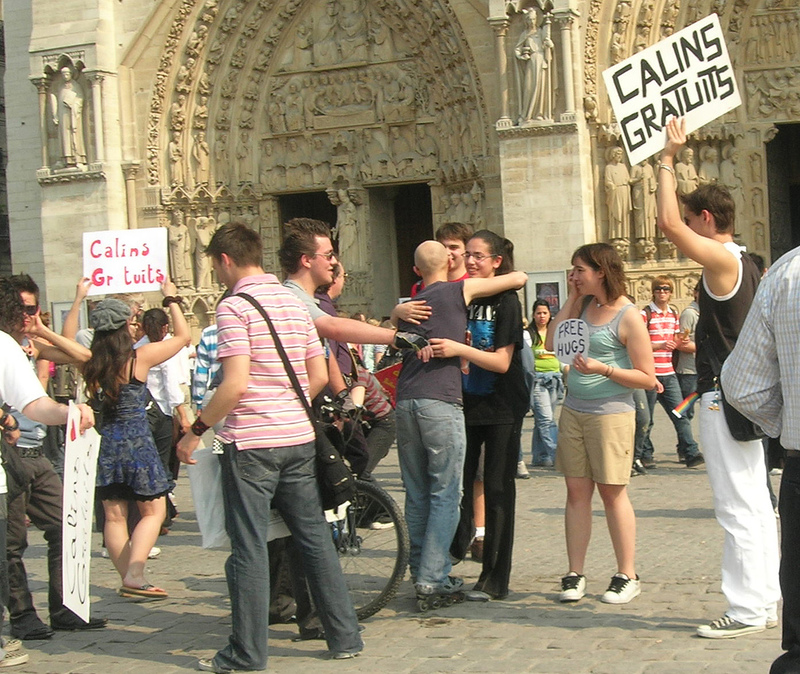 About the center of the area, there was a group of young people with the “Free Hug” signs. It was an interesting idea and was kind of cool. I like the sentiment, but with the exception of one person, I am averse to human contact (since I was very young). Thanks Disperser. I’m glad you have that one person—you’ll just have to hug that person a lot to make up for your adversion. As for empathy i have a longwinded theory about how that’s part of an overall negative primary behavioral system which i won’y bore you with. Seriously, I understand. I didn’t start out being a hugger and there are certain people/strange strangers I will not hug. I sort had to make myself a hugger. I discovered once I stopped thinking how icky they were, I started to enjoy them. I bet you would too if you just hugged the right people. The French are kind touchy-feely eh? There’s irony for you. As to empathy and “overall negative primary behavioral system” thanks for not getting into that. It is morning here and I haven’t had my coffee yet. I don’t think you are a negative bore, I think you are a realist who seeks the truth. Refreshing in this world. lol. I’d get a slipped disk from bending over, they’re so tiny. I think our politicians need to have some hugs! Jasmine–You are a genius! You are so right, it never occurred to me but yes, those politicians NEED hugs….I bet everything would run smoother and maybe we wouldn’t have all these damn wars. I wish we could all get along. WE need republicans and we need democrats. We need each other! So hugs it is! Great post! Sorry I have been absent, things got hectic at work…somewhat calmer now. Trying to load your past posts…my reader is being flakey so if you see it all of a sudden later this week that is why. Your head is just brimming with such great ideas…. and overflowing. What fun! My arms are open for a hug already. Thanks for sharing this lovely thoughts. You must be a wonderful personality. I am excited at this.